Lectiones Secundae is part of the Artes Latinae series, which is a programmed, self-teaching Latin course structured to accommodate multiple levels of students, each learning at his or her own pace. 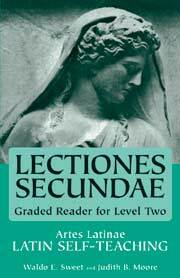 A graded reader for second-year Latin students, Lectiones Secundae features units that include prose, poetry, and aphorisms (sententiae). Authors represented in the book include the well-known, such as Caesar, Martial, and Phaedrus, as well as the lesser-known writers, whose work is included to illustrate the scope of Latin literature and the span of time it covers.